Julian Zelizer says the many Republican debates have spent little time on foreign policy. Editor's note: Julian Zelizer is a professor of history and public affairs at Princeton University. He is the author of "Jimmy Carter" (Times Books) and author of the forthcoming book "Governing America" (Princeton University Press). 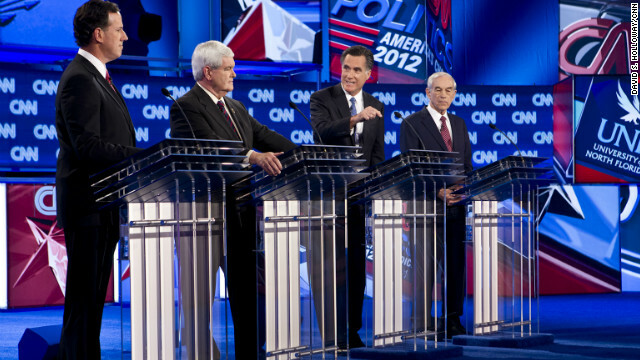 Princeton, New Jersey (CNN) -- It is natural that domestic issues are dominating the 2012 presidential campaign. Voters are worried about receiving their next paycheck and being able to pay the mortgage. They don't have much patience for hearing about what is going on in Syria or Pakistan, particularly since they don't feel any imminent threat. Although the candidates have taken part in some debates devoted to foreign policy and nations such as China have entered into the campaign rhetoric, by and large the issue has played a secondary role on the campaign trail. That's dangerous. The United States is facing a number of major foreign policy challenges that could flare up in the coming years. In November, voters won't have much of a sense about how the parties would address these issues, nor are politicians using the campaign to highlight key issues to voters, one of the functions that our campaigns serve. Perhaps the biggest issue is Iran. Tensions have been rapidly escalating with the Iranian government, which has continued to issue provocative statements and to work on its nuclear weapons program. There is a very real possibility that Israel could launch a military strike on Iran in the near future. The United States has been ratcheting up the economic and diplomatic pressure on the country. There is a strong chance that the international community will be forced to deal with this threat in the near future. The second issue involves the aftermath of the Arab Spring. Last year the world watched eagerly as the impossible suddenly seemed possible. Dictators were overthrown and the region headed toward a democratic revolution. Yet recently there have been reversals. The military crackdown in Syria has undercut the momentum of the changes that took place, while the rise of Islamic fundamentalists in Egypt and Yemen has confirmed some of the fears that existed when the region's governing structure was overturned. If the international community is to keep the region from deteriorating, there is a need for a proactive policy to support the democratic trends of the past year. There are also questions about potential terrorist threats. The death of Osama Bin Laden and the weakening of the infrastructure of al Qaeda were huge victories for U.S. policy. But there is a danger in complacency. There are growing concerns in Europe as well as the United States about less organized and more unpredictable, small scale attacks by loners who are inspired by anti-Western rhetoric but who don't have much of a formal connection to established networks. There are also big leadership changes on the horizon in Asia, ranging from a new leader in South Korea to large turnover that will take place in the Politburo in China as a result of a huge wave of retirements as President Hu Jintau steps down. These shifts can easily create instability and posturing to test the boundaries of allies and opponents. Finally, there are also economic concerns about the future of Europe. This has been the one area where the impact on Americans has been more immediately felt, with the wild swings of the stock market based on concerns about defaults in European countries. Europeans have struggled to agree on collective solutions. Still, what the United States should do about this crisis has not been a topic of frequent discussion among the candidates. Unfortunately, it seems that 2012 will join a list of elections in which foreign policy was either ignored or handled in anachronistic fashion with parties missing the big changes until after they occurred. In 2000, Gov. George W. Bush and Vice President Al Gore were talking about recessions, high technology and lock boxes, as well as nation-building to a limited extent, while al Qaeda prepared to launch one of the most devastating attacks on the United States in the nation's history. The big issues of homeland security and counterterrorist policies received almost no scrutiny on the campaign trail. While politicians later said the threat was impossible to foresee, there were bipartisan commissions that had raised warnings about the weaknesses in the homeland security infrastructure and numerous voices, such as Richard Clarke, telling fellow officials that al Qaeda, which conducted several strikes in the 1990s, was a massive threat. Similarly, in 1936 FDR and Alfred Landon squared off in a debate about domestic programs. FDR moved to the left, pushed by third-party movements saying he was spending too much and launching programs mired in corruption. The growing storms in Europe and Asia, which would result in the devastation of World War II, received minimal attention. As the historian William Leuchtenburg wrote of the dangers in Europe, "This was a peril most Americans chose to ignore. Absorbed in meeting the endless personal crises posed by the Depression, they had little patience with admonitions to direct their attention abroad." In 1988, the candidates did talk about foreign policy but did so in the style of a parody rather than a substantive discussion about one of the biggest changes of the century. Vice President George H.W. Bush looked backward, depicting Massachusetts Gov. Michael Dukakis as a politician who would be weak on defense and be unable to stand up to the Soviet Union. Dukakis spoke primarily about domestic issues as well as the need to contain nuclear proliferation. The collapse of the Soviet Union, which many politicians were still skeptical about, received almost no attention. When the United States needed to figure out how to handle the post-Cold War world, the candidates were still fighting like it was 1952. It's a grave error to elect politicians without having any gauge of what they think and what they would do on the foreign policy issues that they will face in their presidency. Unfortunately, it seems that we are once again losing an important chance to have a national dialogue and to prepare for the challenges ahead.